Joseph Stalin (born as Losif Vissarionovich Dzhugashvili in Gori, Tiflis Governorate, Russian Empire, died in Kuntsevo Dacha near Moscow, Russian SFSR, Soviet Union), he is also known as Joseph Vissarionovich Stalin, was a famous Leader from Russia, who lived between December 21, 1879 and March 5, 1953. He became 73 years old. Joseph Vissarionovich Stalin was a Soviet Union's dictator from 1924 to 1953. The Russian name "Stalin" that he began using in 1913, means "steel" or "steel man". Stalin's rule was characterized by a strong personality cult, extreme concentration of power, and little concern for the harder impact of his policies. 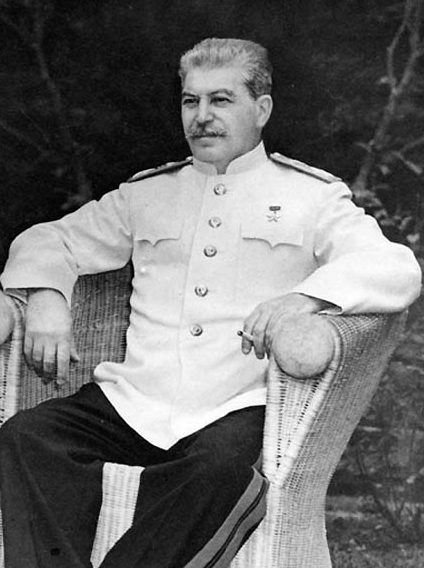 Stalin tried to suppress any opposition through terror and arbitrary bureaucratic machinery. Estimates of the number of people who died as a result of measures implemented under Stalin's leadership is highly variable, but an average estimate of 20 million sounds of a 23-year period. Millions of people were sent to Gulag concentration camps. Nikita Khrushchev, who came to power after Stalin, condemned the repression of both personal cult in 1956 and launched an process to close down all the camps. Stalin became General Secretary of the Communist Party in 1922, and built up his influence on this basis. During the power struggle after Vladimir Lenin's death Stalin was able to set aside his rival Leon Trotsky. In the 1930s he implemented extensive purges, which peaked in 1937. Because many farmers opposed forced collectivization of agriculture, put Stalin's brutal regime in force against the "kulaks" and starved millions to death. In the famine of 1932-1933 lost about six million people their lives. Stalin deemed to have been the most important individual for the design of the Soviet regime until 1991, though many Maoists, anti-revisionists and others consider that the true spirit of Soviet Socialist was betrayed shortly after Stalin's death. Stalin's system of government based on Marxist-Leninism is often characterized as a distinct governance (Stalinism) and is regarded as a totalitarian ideology. During his rule Stalin exterminated 20 million people. Stalin replaced Lenin's New Economic Policy (NEP) with a five-year plans in 1928, about the same time he began to run through the collectivization of agriculture. One goal was to transform the Soviet Union from a primarily agrarian society to a modern industrial state and a geopolitical superpower. After the Second World War, the Soviet Union quickly to reach this goal, and for about four decades after his death the country retained its position as one of the world's two superpowers. As a result of the Second World War, Stalin also to subdue most of Eastern Europe and parts of Central Europe, where Soviet-loyal Communist dictatorships were inserted. He is born under the zodiac sagittarius, who is known for Philosophical, Motion, Experimentation, Optimism. Our collection contains 26 quotes who is written / told by Joseph, under the main topic Politics. "The death of one man is a tragedy. The death of millions is a statistic"
"Mankind is divided into rich and poor, into property owners and exploited; and to abstract oneself from this fundamental division; and from the antagonism between poor and rich means abstracting oneself from fundamental facts"
"It is enough that the people know there was an election. The people who cast the votes decide nothing. The people who count the votes decide everything"
"If the opposition disarms, well and good. If it refuses to disarm, we shall disarm it ourselves"
"If any foreign minister begins to defend to the death a "peace conference," you can be sure his government has already placed its orders for new battleships and airplanes"
"I trust no one, not even myself"
"I believe in one thing only, the power of human will"
"History shows that there are no invincible armies"
"Gaiety is the most outstanding feature of the Soviet Union"
"Everyone imposes his own system as far as his army can reach"
"You cannot make a revolution with silk gloves"
"The Pope? How many divisions has he got?"